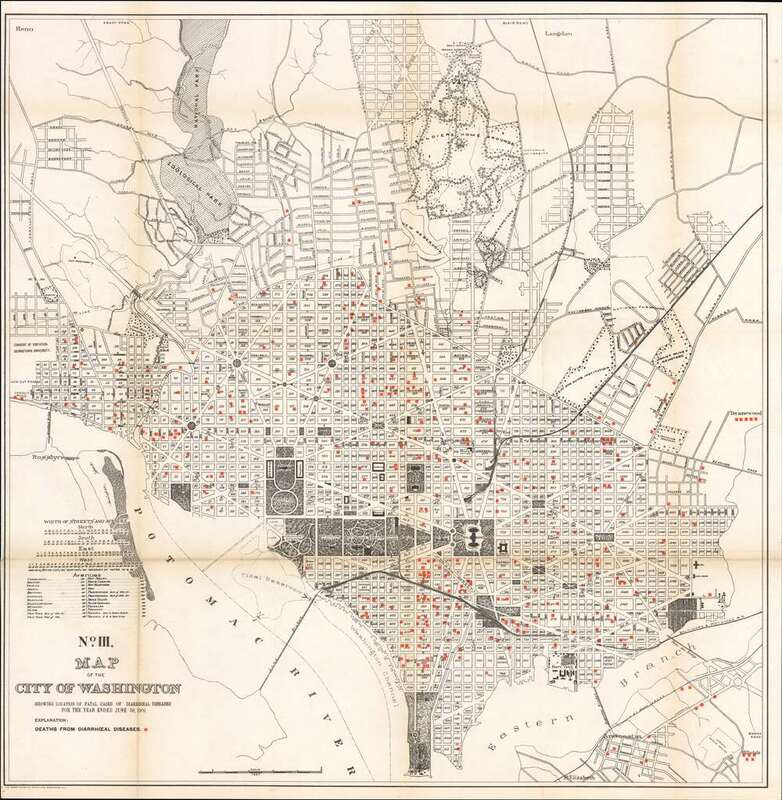 Fascinating map of Washington, D.C. depicting fatal cases of diarrheal diseases. No. III. Map of the City of Washington Showing Location of Fatal Cases of Diarrhœal Diseases for the Year Ended June 30, 1901. A fascinating 1901 Norris Peters map of Washington D.C. illustrating fatal cases of diarrheal diseases. This large map covers from the Rock Creek Cemetery to Haines Point and from Georgetown to the Anacostia River. City Blocks are identified numerically. The map has been overprinted with a symbol to illustrate fatal cases of diarrheal diseases throughout the city. The map is part of a series printed by the Norris Peters Company of Washington D. C. to illustrate a report to the Commissioners of the District of Columbia. This map appears to be quite rare. We have been able to identify one other example in institutional collections. Very good. Backed on archival tissue for stability. Wear and slight soiling along original fold lines.